Health Aid Lecithin derived from Soybeans Oil is a natural source of Phosphatidyl choline (6-12% per cap. ), Choline, and of Phosphatidyl inositolis (5%-8% per cap.). A natural emulsifier which assists in breaking down fat and transporting it through the blood vessels it may be beneficial to those on a calorie controlled diet, a low cholesterol diet or trying to manage their weight. 1200mg of unbleached Lecithin (derived from Soybean Oil) per capsule. Contributes to the breakdown and transportation of fat through the blood vessels. 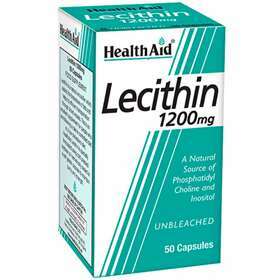 HealthAid Lecithin may benefit those on a calorie controlled diet or a low cholesterol diet. Free From Yeast, Wheat, Dairy, Sugar, Salt, Artificial Colours, Preservatives & Flavourings. Suitable for adults and children over 12 years. Take 1-3 capsules daily. Lecithin (Soybean oil), Capsule Shell agent (gelatine), humectant (glycerine, purified water).